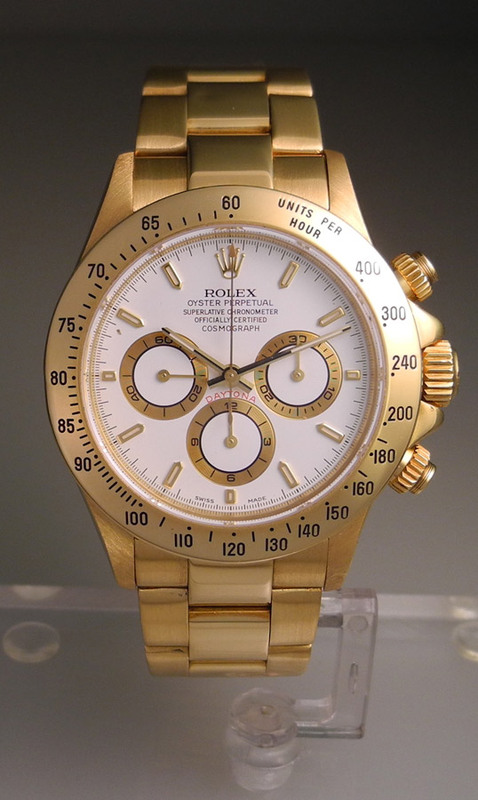 The Rolex Daytona 16528 in yellow gold with white dial is a fantastic watch. A white dial adds a whole new level of cool to the watch. Furthermore Zenith powered Daytona's are in the midst of a boom as collectors and fans have started to embrace them as the next Rolex chronograph to own. 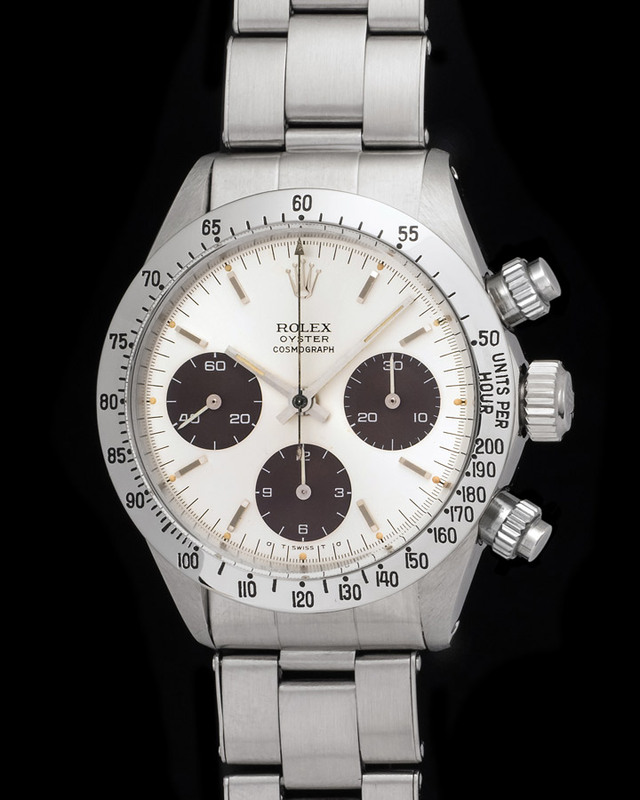 The importance of the Rolex Daytona Zenith is just staring to be felt within the collector community. Unbeknownst to most the Zenith era was one of the most important times for the famed chronograph, due to the fact that it inspired Rolex to create fully in-house chronograph movement. The Daytona offered here belongs to the W-series representing a 1996 production. Last but no least this Daytona is accompanied by a full set of box and papers, a detail incredibly sought after by die hard Daytona fans. 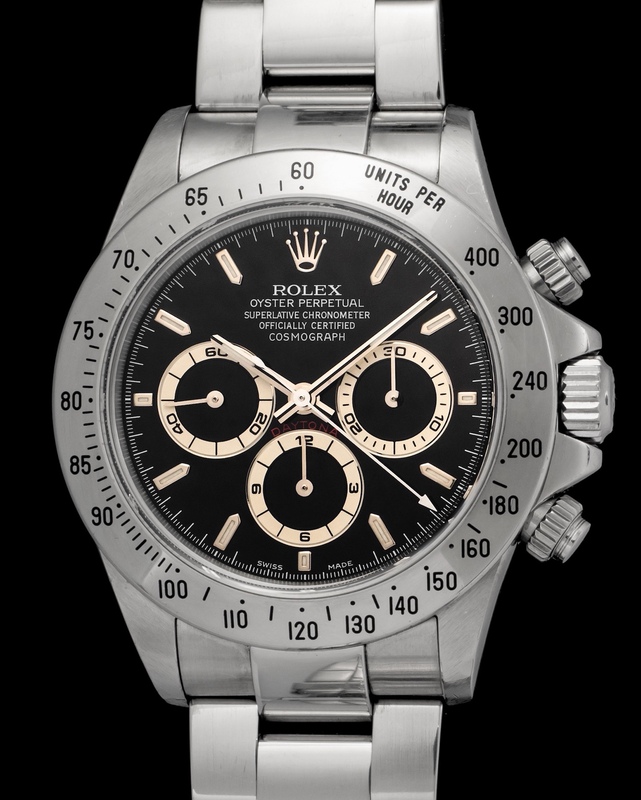 The reference 6240 is one of the nicest most interesting Daytona's due to the fact that it was released to be a sort of prototype, a testing ground for later screw-down pusher bearing Daytona's. Featured by us is a magnificent example of the reference fitted with the ever-cool MKI pushers and a stunning "big logo" silver dial. The Daytona 6241 is an incredibly charismatic iteration of the model. It is well proportionate and the combo between pump pushers and plexy bezel lends for a very wearable watch. 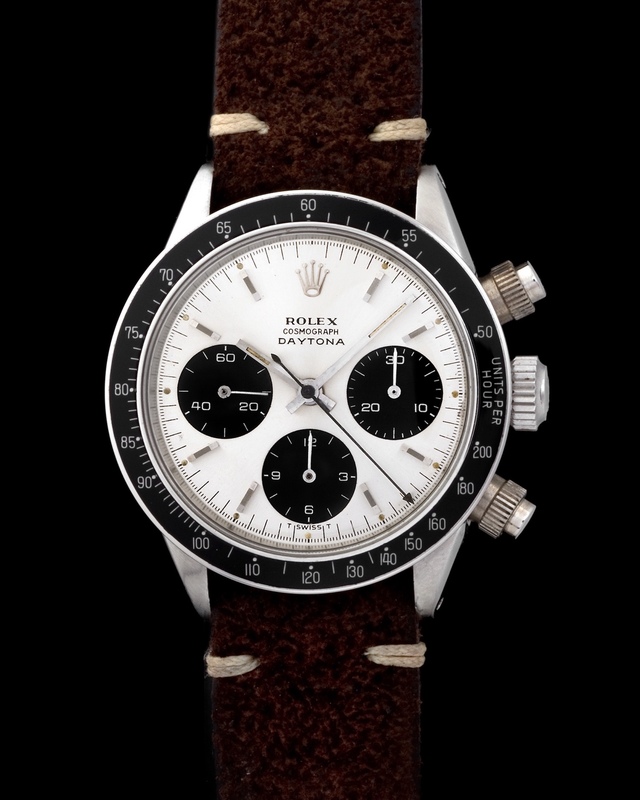 The fact that this watch features a black "Paul Newman - Exotic" dial makes this watch all the more alluring. 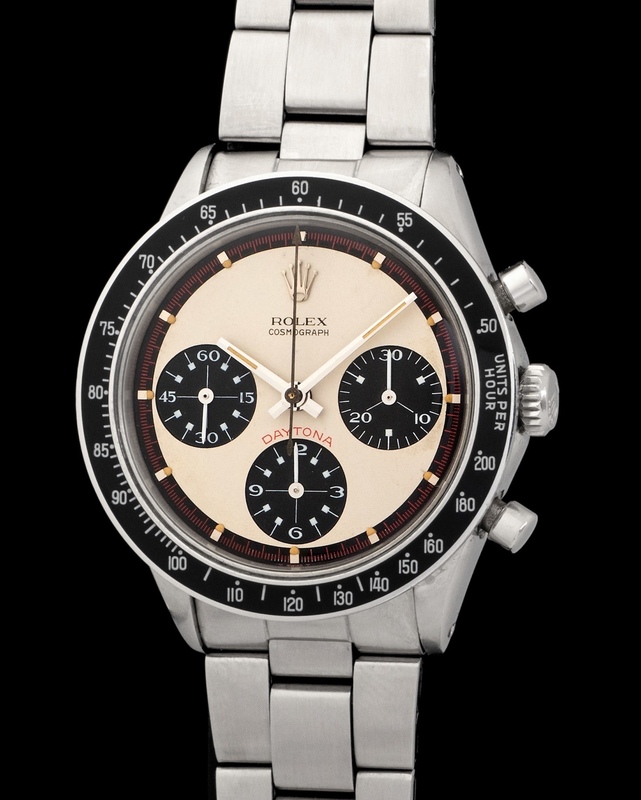 Aside from the fact that the reference 6241 is an all round fantastic Daytona this example here features a "Panda Paul Newman - Exotic" dial, making for a world-class watch. The combination of the black plexy bezel with the white on black & red dial lend for an irresistible sight. Our ref. 6241 hails from 1968 and is fitted with a great condition oyster bracelet. Cooler than a Zenith Daytona is a Sodalite Zenith Daytona. 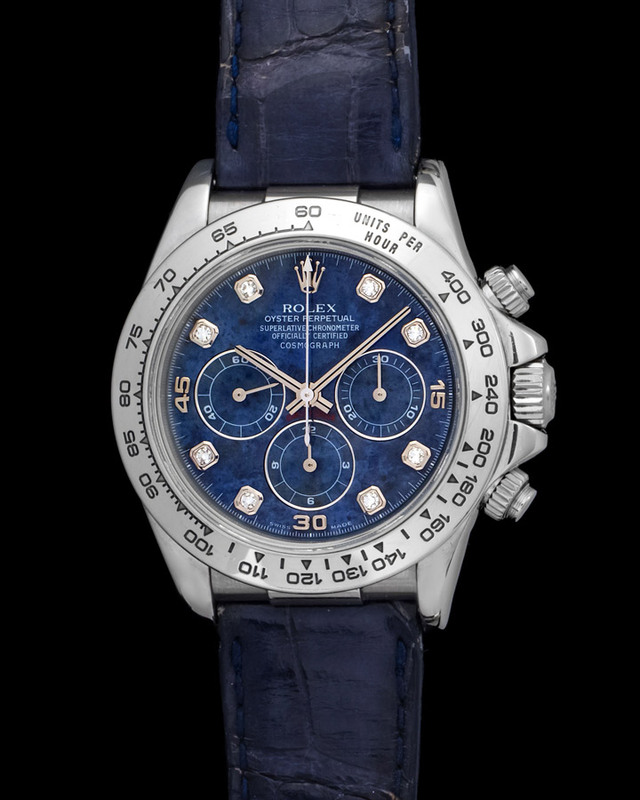 This particular Sodalite Daytona comes with a diamond index dial and a white gold case in top condition. The watch was manufactured in 1999 during the final months of the Zenith production. 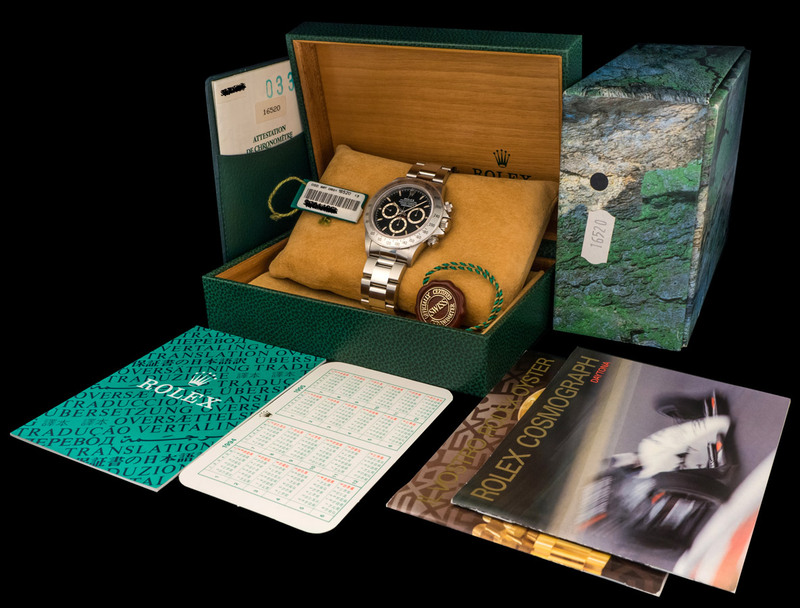 Rolex soonafter incorporated its first in-house movement for the Daytona. 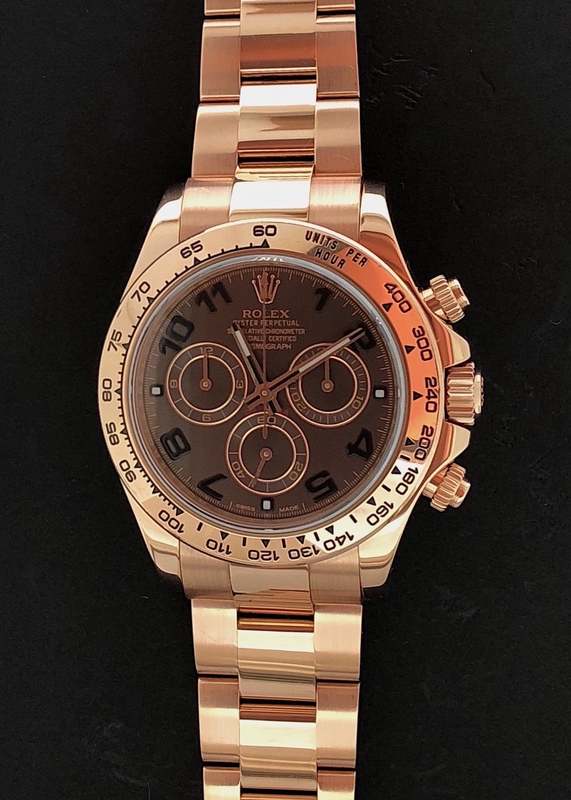 The Rolex Daytona 116500LN has caused intense worldwide commotion with collectors, fans, and newcomers traveling far and wide with the hopes of getting their hands on one. Waitlists for this reference are in some cities backed up years. It is all within reason as this Daytona is truly a spectacular watch, already an instant classic. Ours is fitted with a black dial and retains a full set with a warranty card dated to 2017. 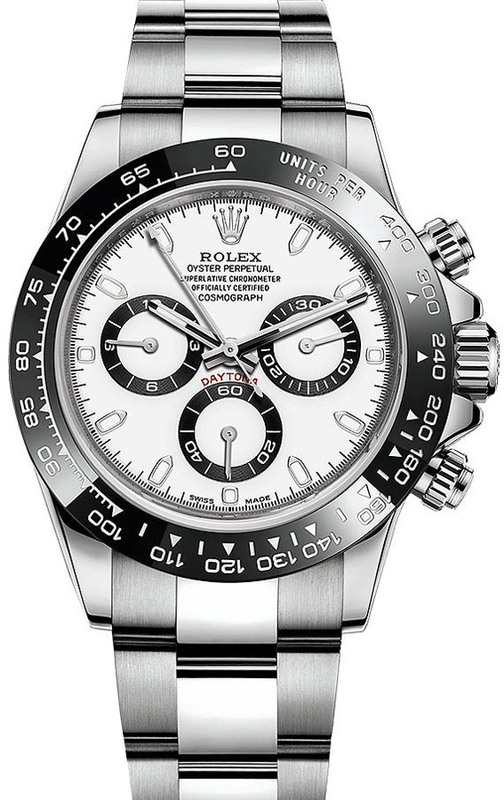 Our Rolex Daytona 116520 is fitted with a desirable white dial and cased in a steel case. 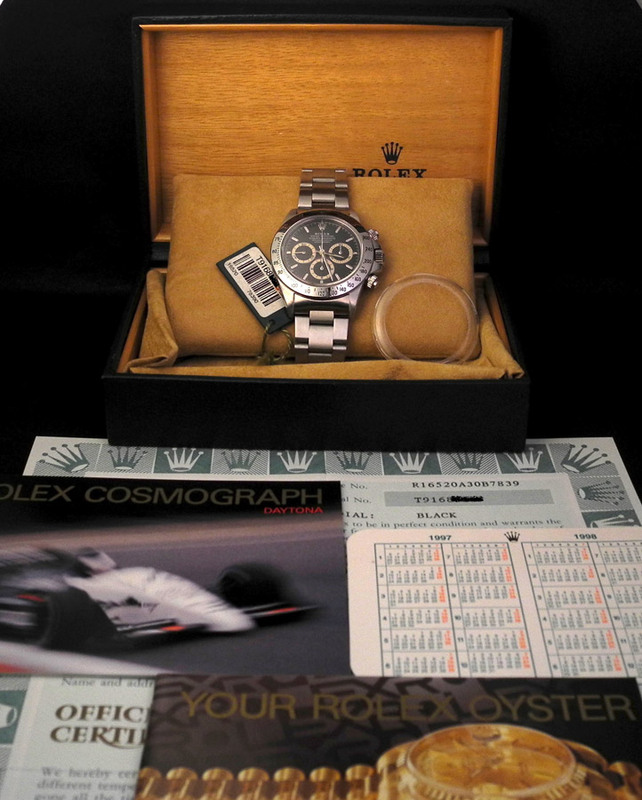 Along with the watch come its original box and warranty card dated to 2007. 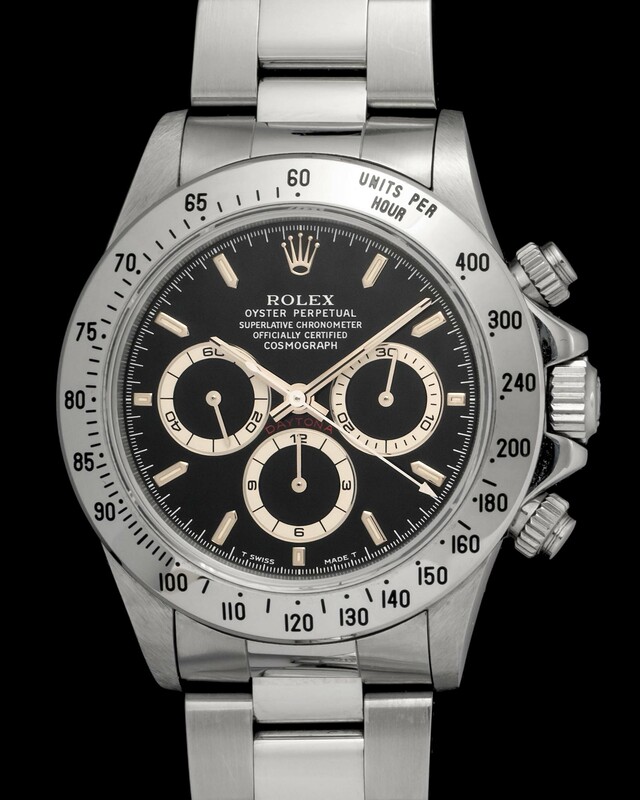 Amazing and like new example of a Rolex Daytona powered by the revered Zenith automatic movement. Bearing a first series 5 line and inverted six dial. Accompanied by a full set of box and papers dating to an L-series or 1989 production date. We have got a special one here. A glance at those pictures will certainly hint at why. Those deep brown counters are a sight to see. It's crazy how a factory error could lend such a cool dial discoloration. Our Daytona 16520 is powered by the ever cool Zenith automatic movement and accompanied by a full set of box & papers. 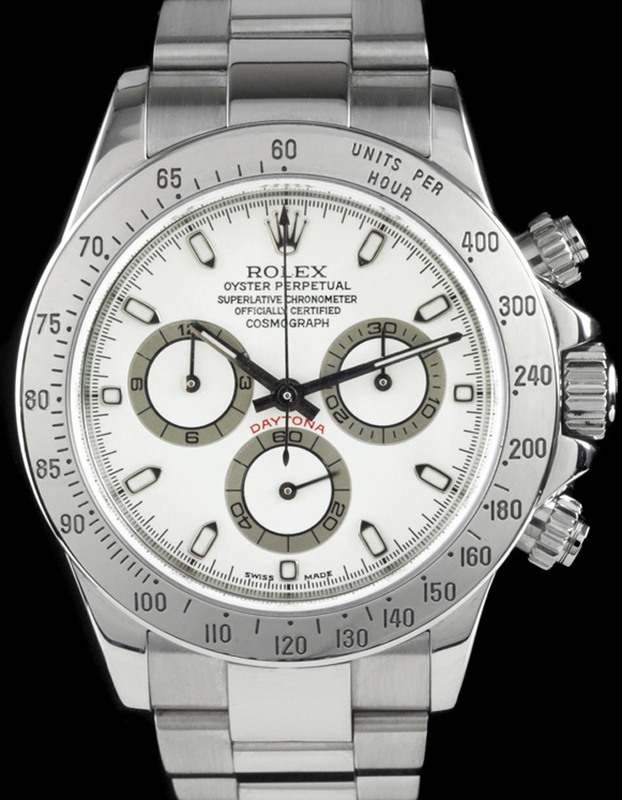 Rolex Daytona manufactured in 1998 from the U series and powered by the coveted Zenith automatic movement. These early automatic Daytona's are gaining traction within the world of watch collecting for the fact that they represent a turning point for the Rolex manufacture. Ours depicted here is in mint condition retaining its original case back sticker and accompanied by its original set of box & papers. 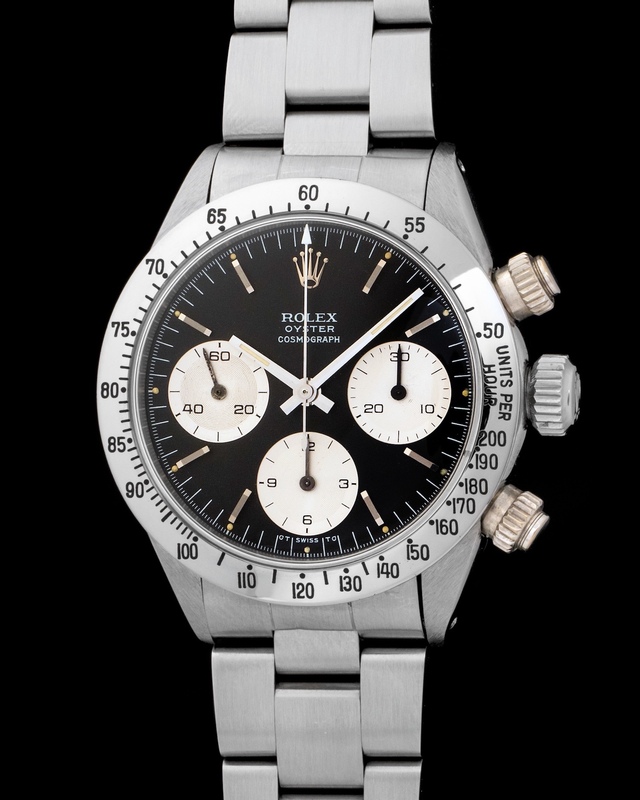 Rolex Daytona 6264 "Paul Newman Exotic Black Dial"
Allow us to introduce a grail Daytona. A reference so limited with a dial so rare that together make for a incredibly collectible watch. The ref. 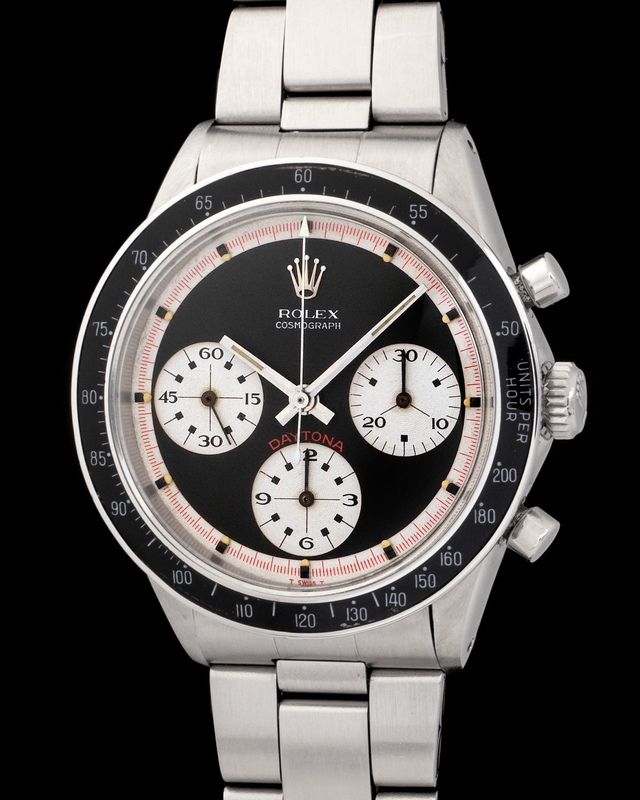 6264 was manufactured sporadically for a period of 2 years, and included in its production were the coveted exotic dials (Paul Newman dial) - available were in white with black, black with white, and the rarest of them all a combination of black, white, and red. Ours here features the elusive three color exotic dial. 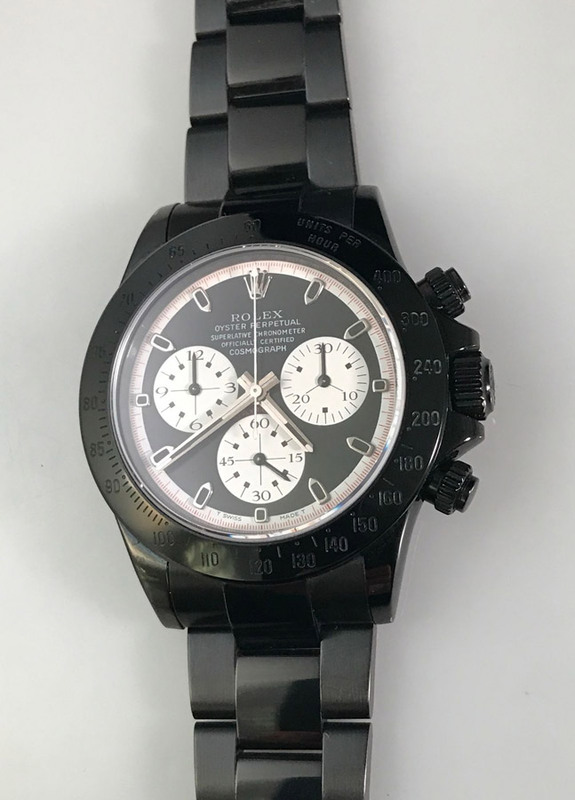 Rolex Daytona 6265 "Black Sigma Dial"
The reference 6265 is perhaps the most wearable manual Daytona as it incorporates a steel bezel, which ads significant sturdiness to the case and screw-down pushers, which protect the dial and movement from water and humidity. Pictured is a special iteration of the reference as it belongs to the early stages of manufacture. Furthermore the dial features the sigma symbols flanking the T Swiss T demarkation at the lower portion of the dial. The presence of a sigma on a dial means that the dial is of the highest quality and features indexes entirely made of white gold. 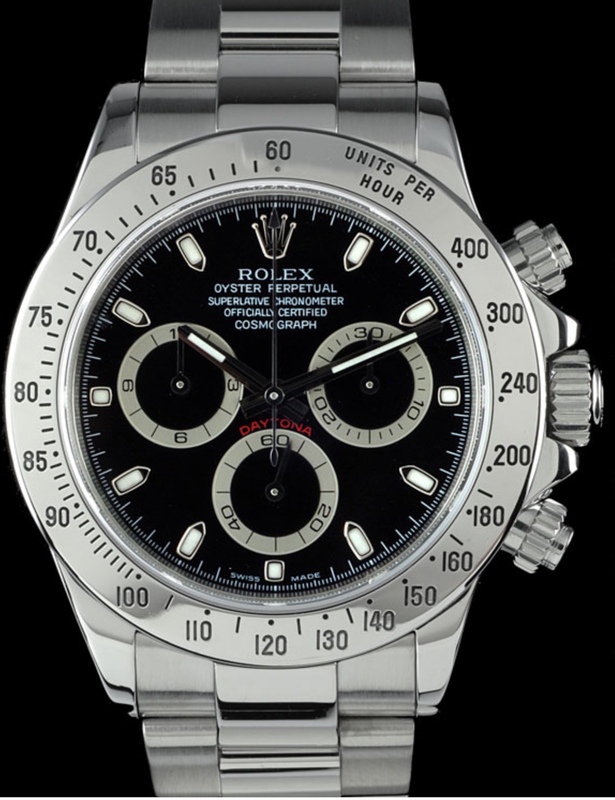 Rolex Daytona manufactured in 1996 from the T series and powered by the coveted Zenith automatic movement. 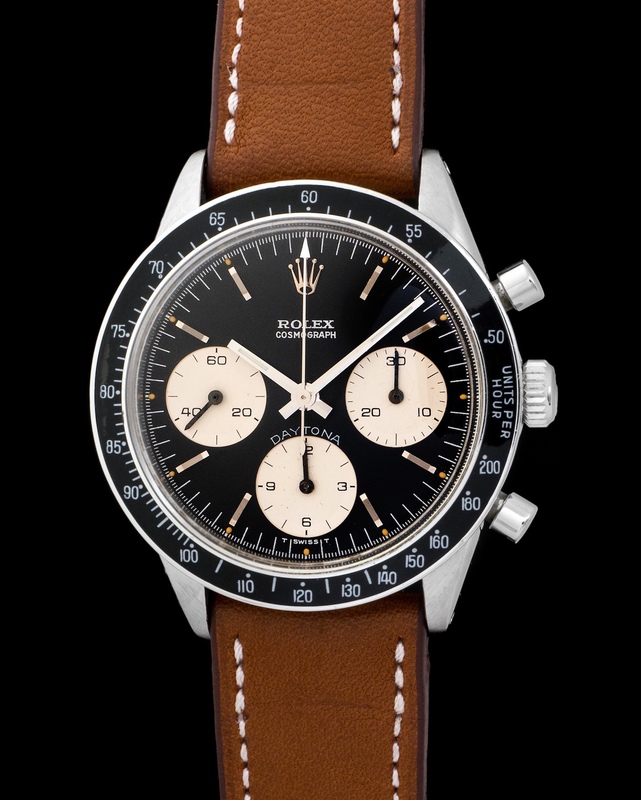 Furthermore this Daytona features light brown sub dials, which is a beauty to behold. The Daytona 6264 is the grail, it's a watch for the true connoisseur. With a production span of only a couple of years this model is one of the rarest most elusive Daytona's ever made. Ours pictured is a phenomenal example in world class condition. Manufactured in 1971, fitted with a beautiful black dial, and put together by a leather strap. 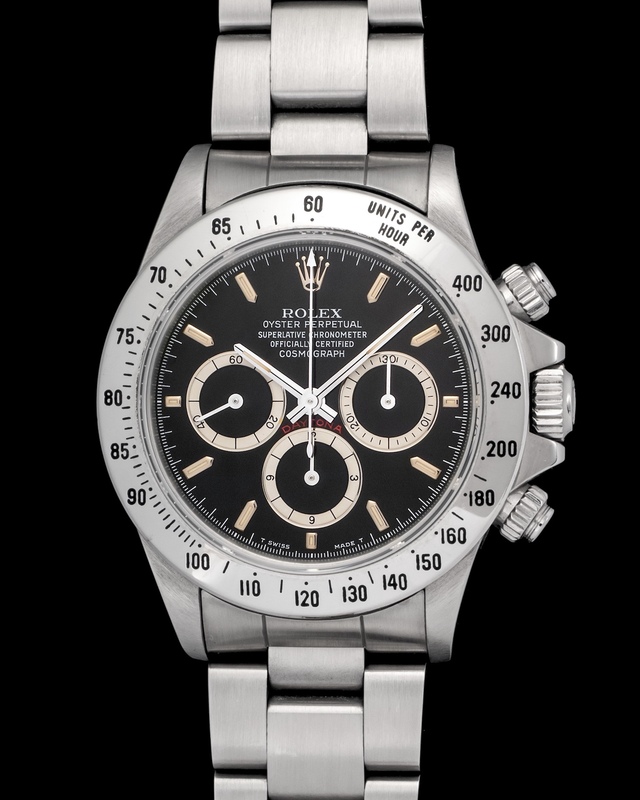 The release of the Rolex Daytona 116500LN caused intense worldwide commotion with collectors, fans, and newcomers traveling far and wide with the hopes of getting their hands on one. Waitlists for this reference are in some cities backed up years. It is all within reason as this Daytona is truly a spectacular watch, already an instant classic. Ours is fitted with a black dial and retains its box & papers. 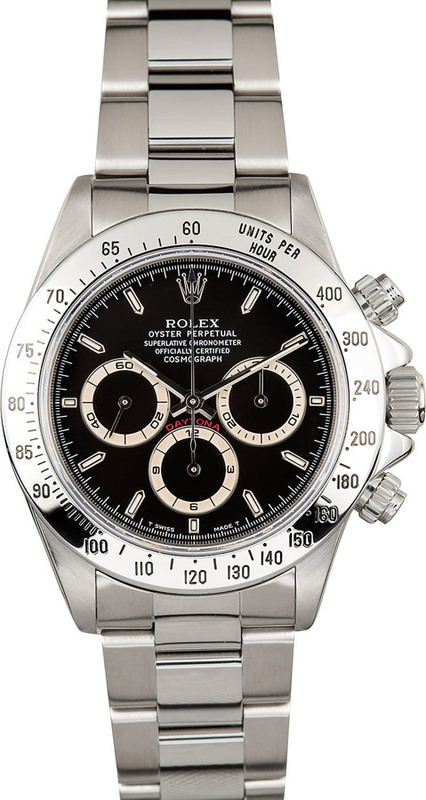 This is an excellent Rolex Daytona Cosmograph Ref.6240 in stainless steel. Manufactured in 1965, this early model has still got the original MK1 screw down pushers and the "small Daytona" print, ultra rare and coveted detail. Rolex introduced the 6240 in 1965 with its waterproof screw down pushers in order to improve the pump pusher references 6239 and 6241. Soon after references 6263 and 6265 were released. This is a gentleman's Rolex Oyster Perpetual Cosmograph Daytona, reference 116520, with the white dial and index markers. It also has the stainless steel Rolex Oysterlock Bracelet. 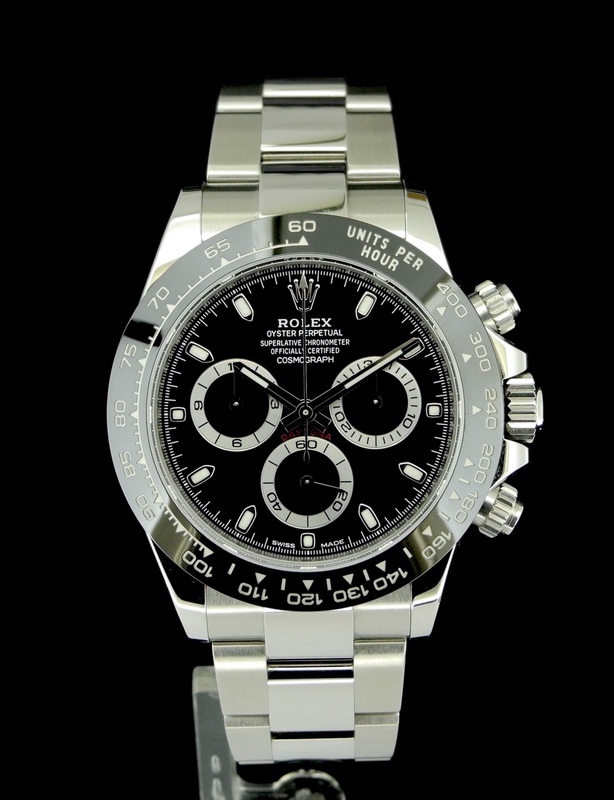 This Steel Daytona is a 40mm Rolex which is 4mm larger that the classic Datejust model. 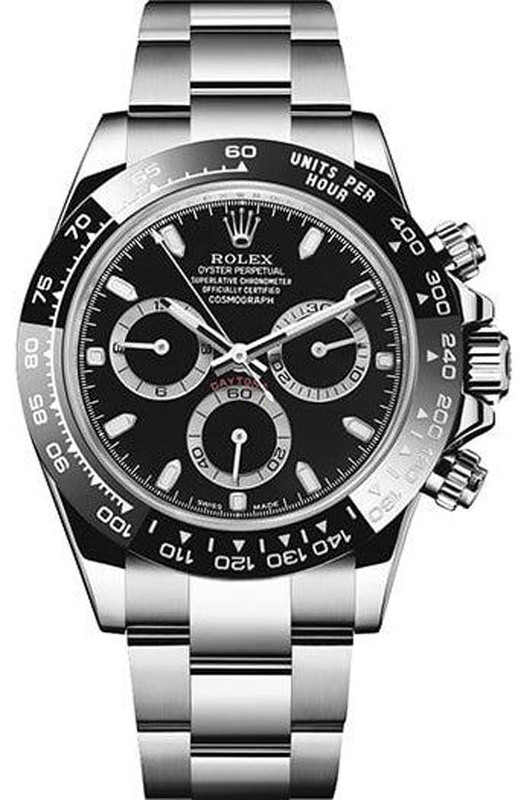 It has the Daytona steel tachymeter engraved bezel with a scratch resistant sapphire crystal. 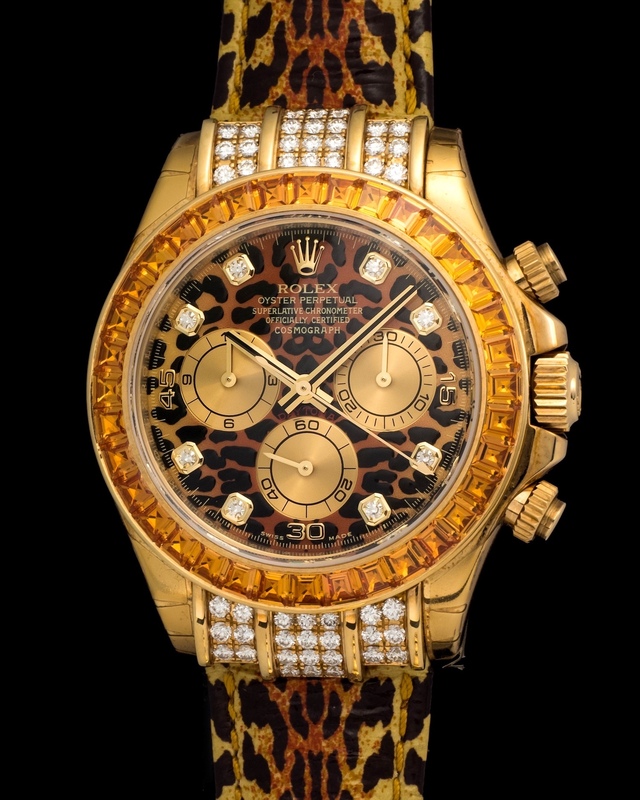 This Rolex is absolutely in pristine condition. 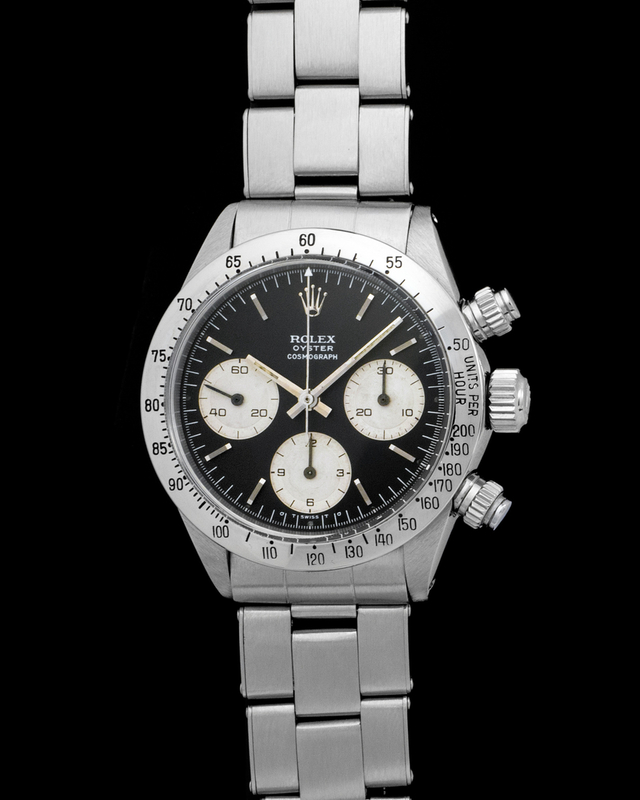 The importance of the Rolex Daytona Zenith is just staring to be felt within the collector community. Unbeknownst to most the Zenith era was one of the most important times for the famed chronograph, due to the fact that it inspired Rolex to create fully in-house chronograph movement. The Daytona offered here belongs to the S series representing a 1993 production. Last but no least this Daytona is accompanied by a full set of box and papers, a detail incredibly sought after by die hard Daytona fans. 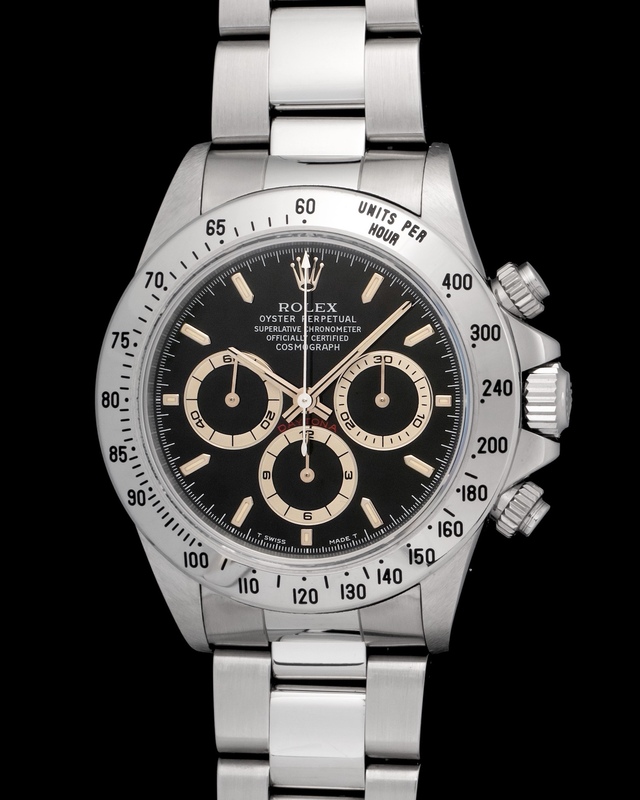 Rolex Daytona manufactured in 1996 from the T series and powered by the coveted Zenith automatic movement. These early automatic Daytona's are gaining traction within the world of watch collecting for the fact that they represent a turning point for the Rolex manufacture. 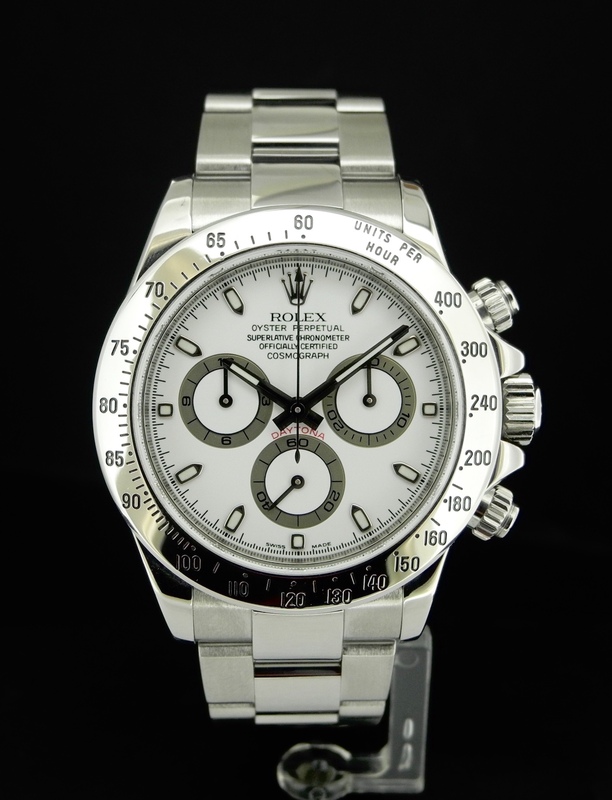 Rolex Daytona 116520 fitted with a desirable white dial and cased in a steel case. Along with the watch come its original box and papers. 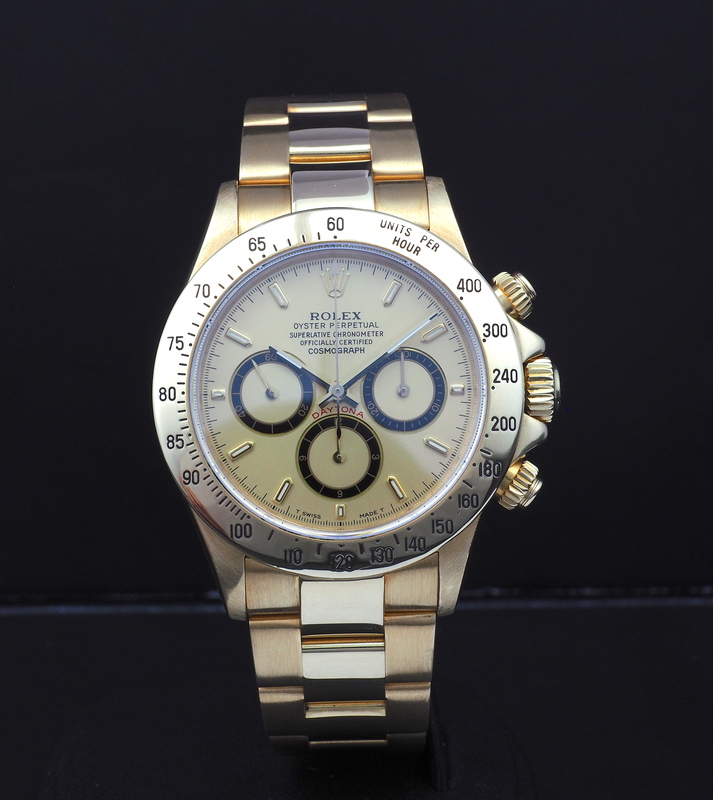 Manufactured in 2008, bearing a M serial is this top condition full set Rolex Daytona 116520. The most beautiful detail about this Daytona is the fact that it's in New Old Stock condition, meaning it retains its factory stickers. A true time capsule. 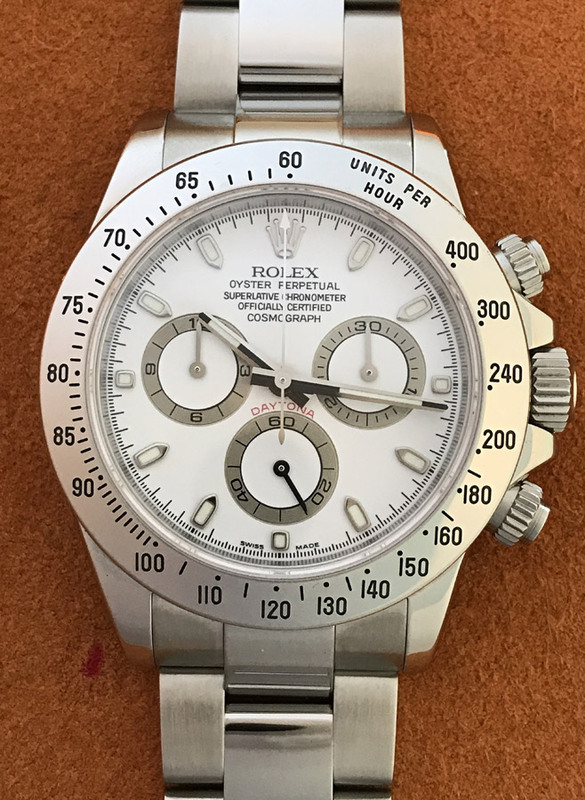 The release of the Rolex Daytona 116500LN caused intense worldwide commotion with collectors, fans, and newcomers traveling far and wide with the hopes of getting their hands on one. Waitlists for this reference are in some cities backed up years. It is all within reason as this Daytona is truly a spectacular watch, already an instant classic. Ours is fitted with a black dial and still retains all its stickers, tags, and papers. We are offering a special strand of Daytona called the Daytona Beach. These watches were produced sporadically in an array of colors and fitted with a cool assortment of dials and case metals. Our Daytona is 40mm cased in white gold with an untouched pink mother of pearl dial adorned by roman numerals. 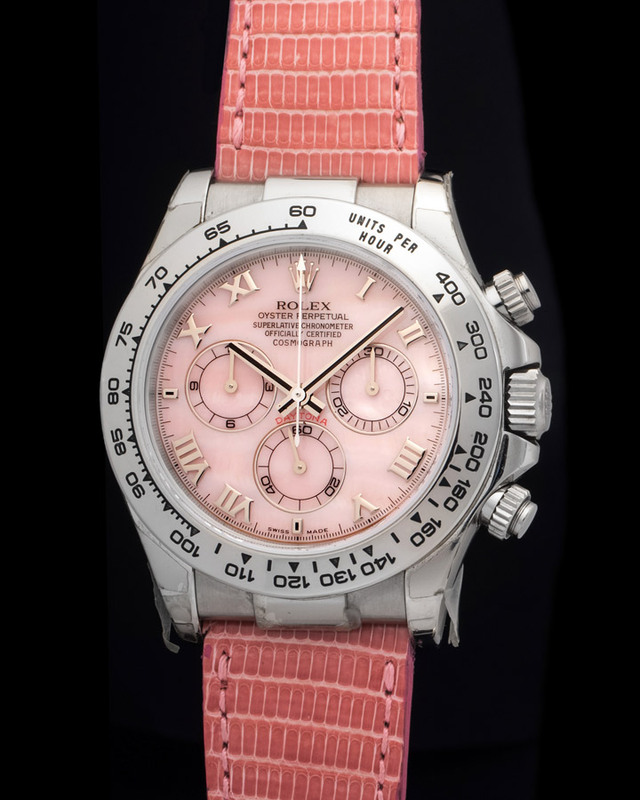 The leather strap is pink and is put together by a white gold Rolex signed clasp. This particular watch was manufactured in 2002 and is accompanied with our full warranty. really amazing and collectable vintage watch. 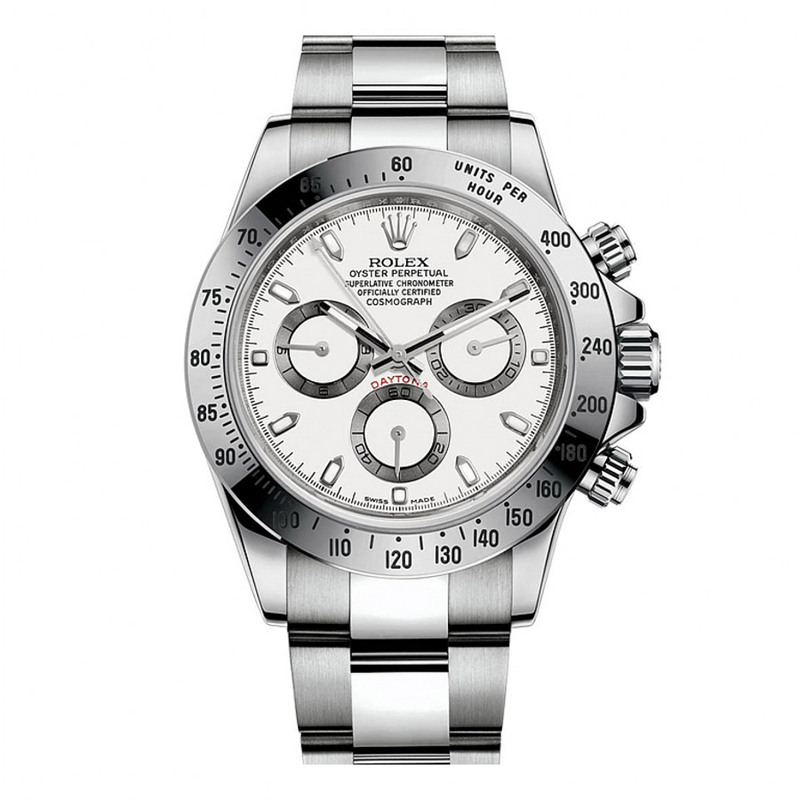 The Rolex Daytona 116500LN is an instant classic, specially with white dial. This watch was manufactured in 2017 and comes with a full set. This Daytona has never been worn, still retaining all its plastics. 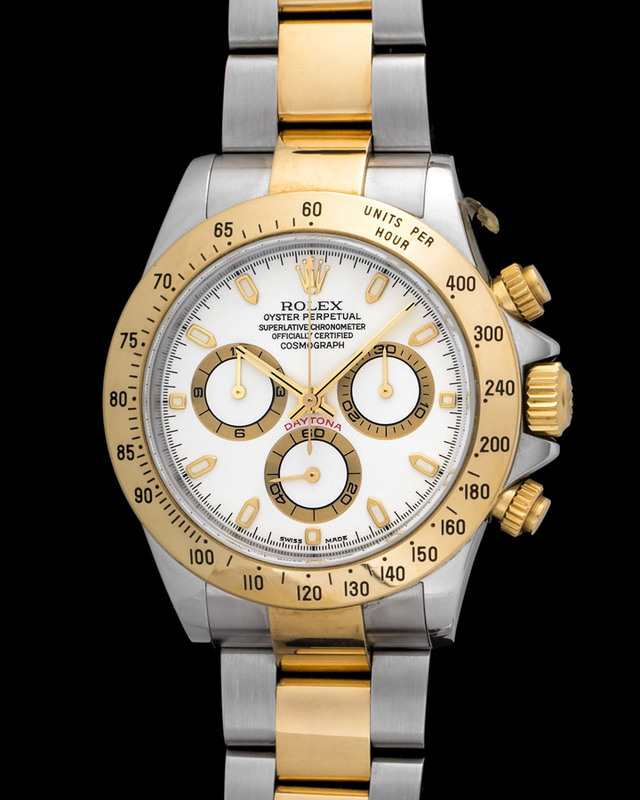 The Rolex Daytona 16528 in yellow gold with white dial is a fantastic watch, a white dial adds a whole new level of cool to the watch. Zenith powered Daytona's are in the midst of a boom as collectors and fans have started to embrace them. THE ULTIMATE CHRONOGRAPH The Rolex Cosmograph Daytona, introduced in 1963, was designed to meet the demands of professional racing drivers. With its highly reliable chronograph and bezel with tachymetric scale, it allows drivers to perfectly measure average speeds up to 400 kilometres or miles per hour, as they choose. An icon eternally joined in name and function to the high‑performance world of motor sport. 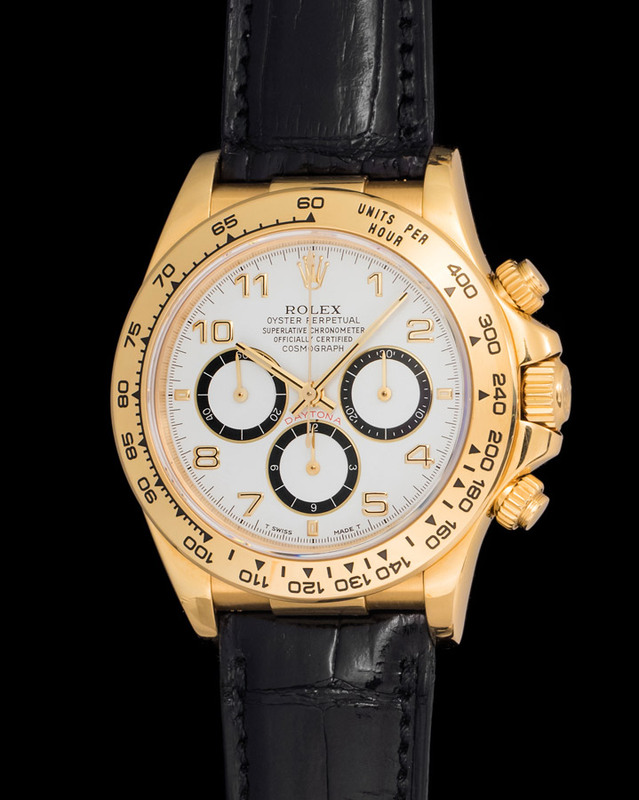 Rolex Daytona 16518 cased in 18k yellow gold and fitted with a rare and sought after white - inverted 6 - arabic numeral dial. Zenith Daytona's are fast becoming the next collectible Daytona. This 16518 comes with a full set and is in top condition, working just as well as it did in 1996. 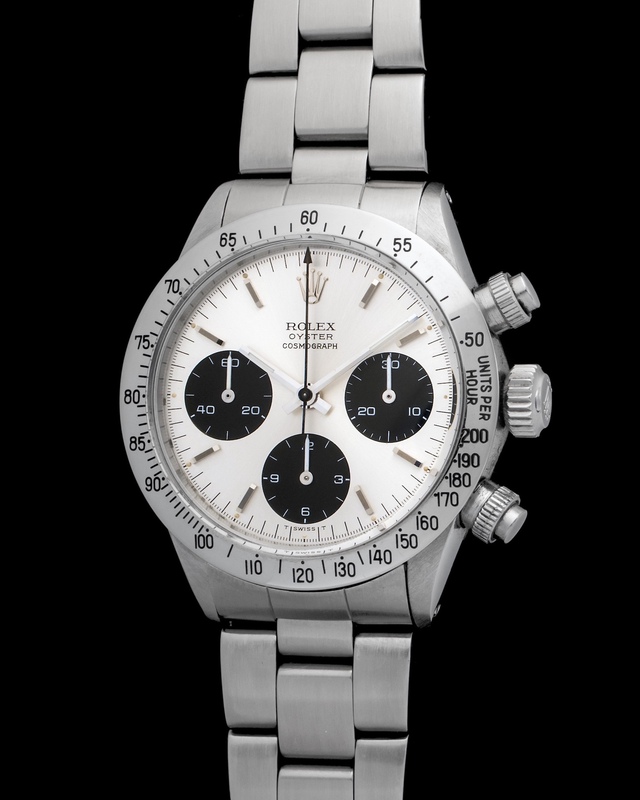 The Paul Newman Daytona is hands down the most influential iteration of the model and arguably of the watch world. The Bamford Watch Department has done an outstanding job of paying homage to the iconic chronograph with their interpretation of a Rolex Daytona Paul Newman. This watch was born a reference 116520 and was later given the signature Bamford treatment. The Daytona has enjoyed a long lasting production range with no indication of stopping. The reference 116520 is fitted with a desirable black dial and cased in steel. Along with the watch come its original box and papers. 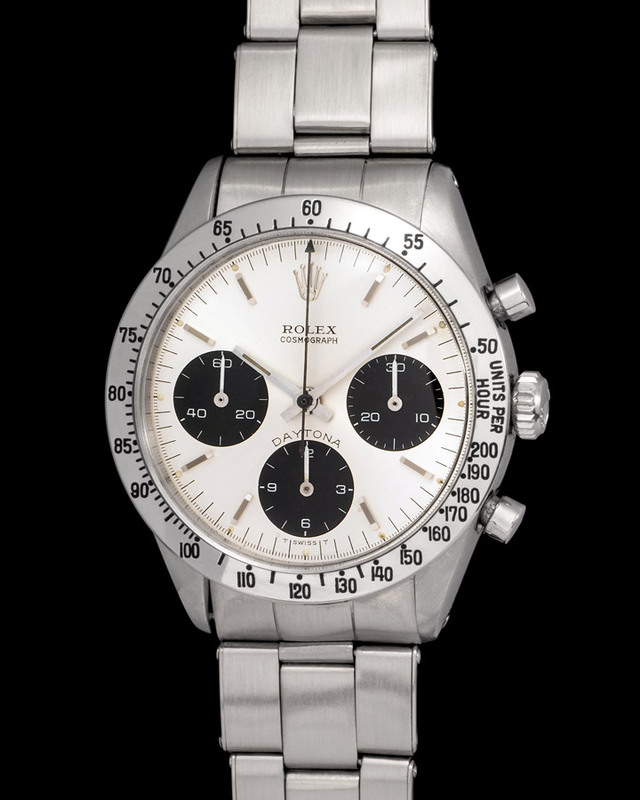 The Rolex Daytona 6265 marked the end of the manual Daytona era, but the mark they left will be everlasting. 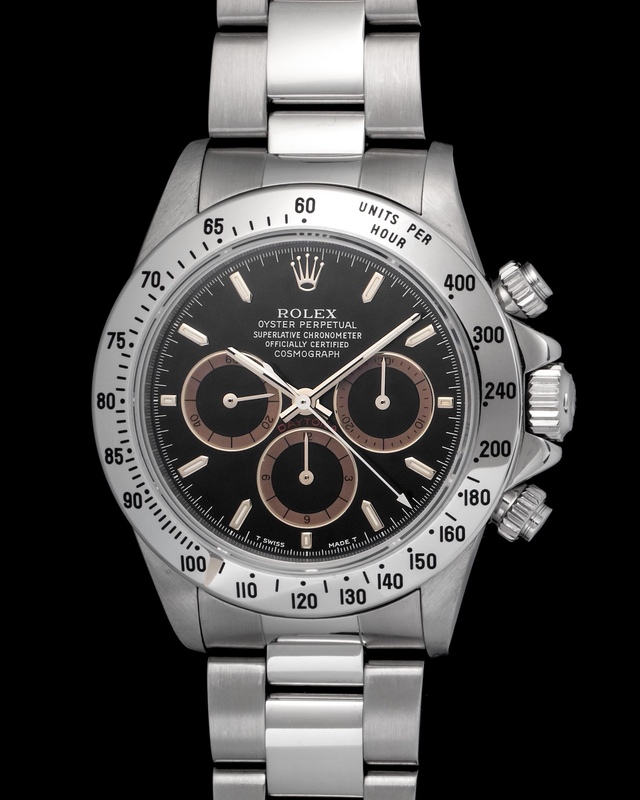 The 6265 is perhaps the most wearable Daytona due to its screw down pushers and steel bezel. They protect the watch from humidity and work to make the case sturdier. Here's a special example of the watch as its chronograph counters have taken a beautiful brown color brought by chemical reactions in the paint's pigmentation. Rolex Daytona 6239 "Fuerza Aerea del Peru"
There is no doubt or discussion that the Rolex Daytona is the most exciting chronograph ever produced. Within the range of Daytona's available there are a handful that take precedent over the rest. We have here of those examples. A Rolex Daytona 6239 specially issued to the Peruvian Air Force. The Rolex alliance with the Peruvian military comes about thanks to a friendship between the official Rolex dealer in Peru and the head of Rolex South America Mr. Heineger. FAP Daytona's share common characteristics such as dials without the word Daytona printed and a lightly engraved "Fuerza Aerea del Peru" located on the caseback. The joy of finding a full set Daytona is unparalleled. Here's a reference 116523 manufactured in 2002 preserved in beautiful condition and accompanied by its original papers and box. Its two tone case aids at making the Daytona both a formal and casual watch. Rolex Daytona 16519 powered by a Zenith movement and adorned with a beautiful Sodalite and diamond index dial. Two details make this a special Daytona. First its automatic movement and second its dial. Zeniths are fast becoming the most appreciated and sought after Daytona’s, as collectors are moving past the manual Daytona phase. The dial on the watch is made from Sodalite, a precious stone not common to dials. 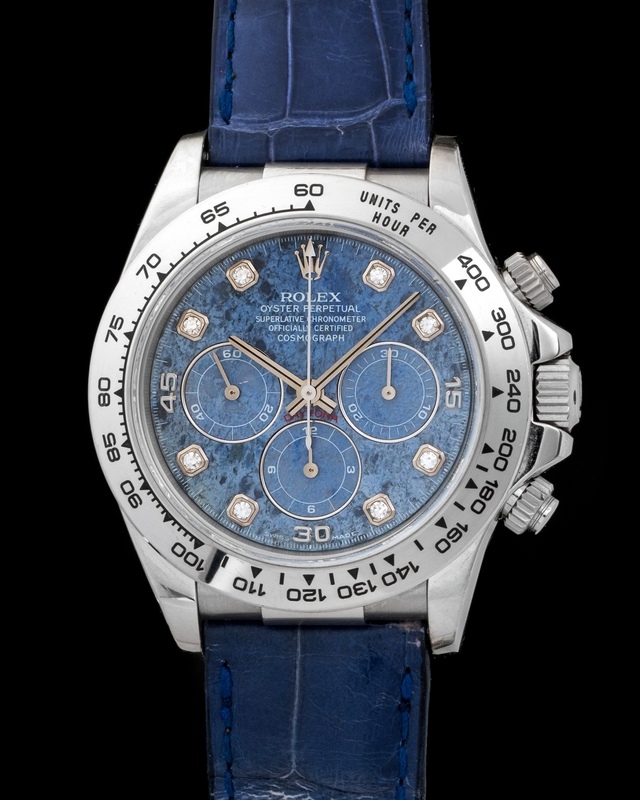 The Daytona comes with its original blue alligator strap, caseback sticker, and original Rolex issued paperwork. Zenith Daytona’s have began to escalate in pricing as collectors and auction houses are slowly moving past their Valjoux counterparts. 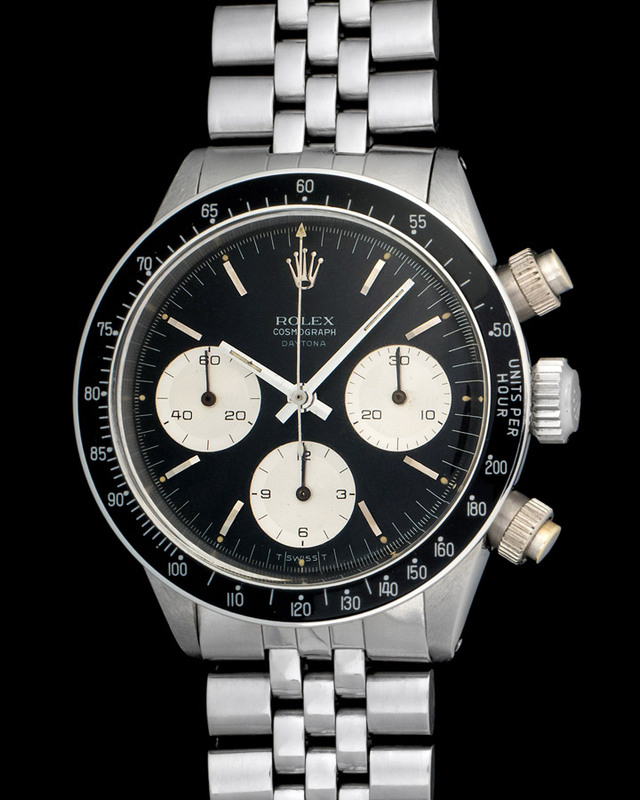 These chronographs are currently undervalued but not for much longer. 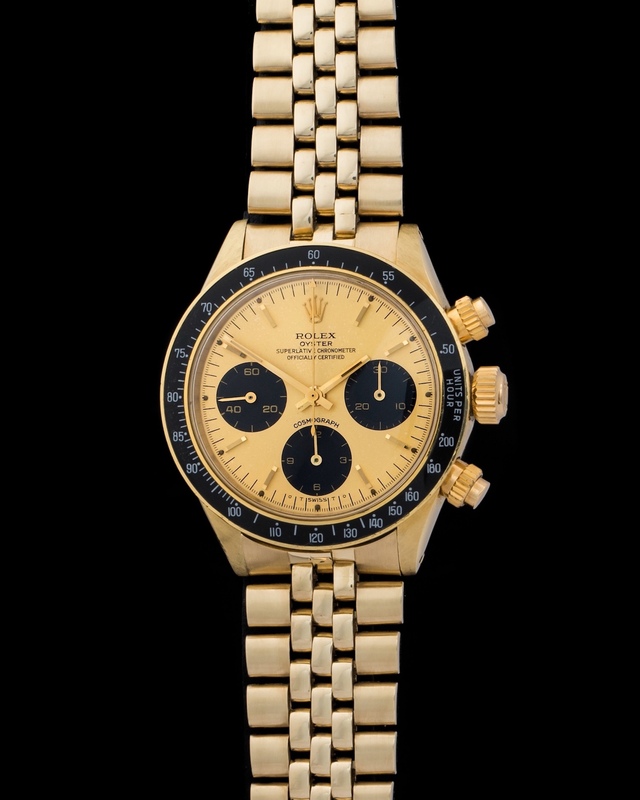 The 18K yellow gold L series Daytona is in great shape. The mix between its gold diamond index dial and inverted six is something not seen on a daily basis. Very rare Rolex Daytona 16528 fitted with a full pave diamond and emerald index dial, as well as accompanied by its original warranty. Finding these dials is getting exceedingly hard these days as collectors are starting to comprehend their beauty and rarity. The overall condition of the 18K yellow gold case and bracelet is second to none. All these Zenith based movements have began to spike in pricing due to collectors gravitating away from Valjoux Daytona’s. The Rolex Daytona powered by Zenith movements is having quite a comeback. These watches are becoming the most desirable Daytona’s out there, and for the first time they are beating the previous Valjoux models. 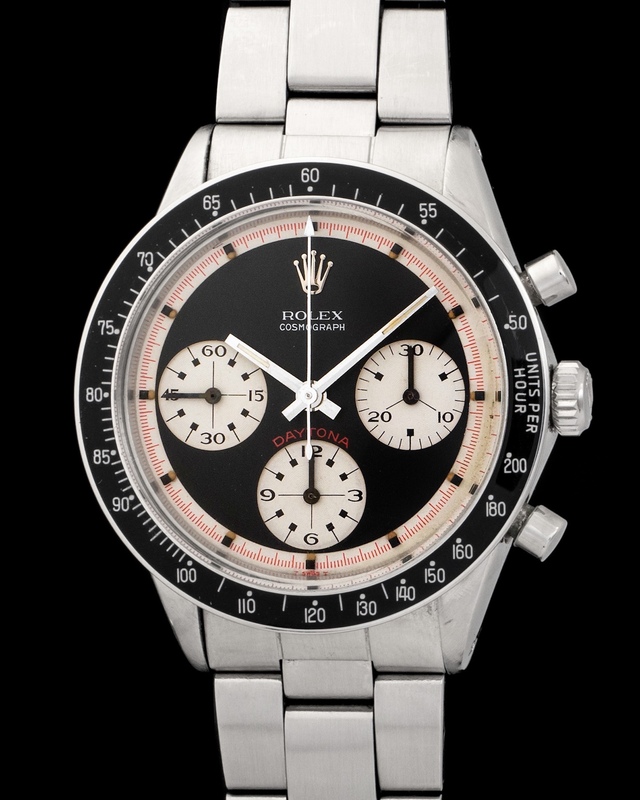 The Daytona we have here is a beautiful example of the famed chronograph as its condition is second to none, while its black dial coupled with diamond indexes is one not commonly found. 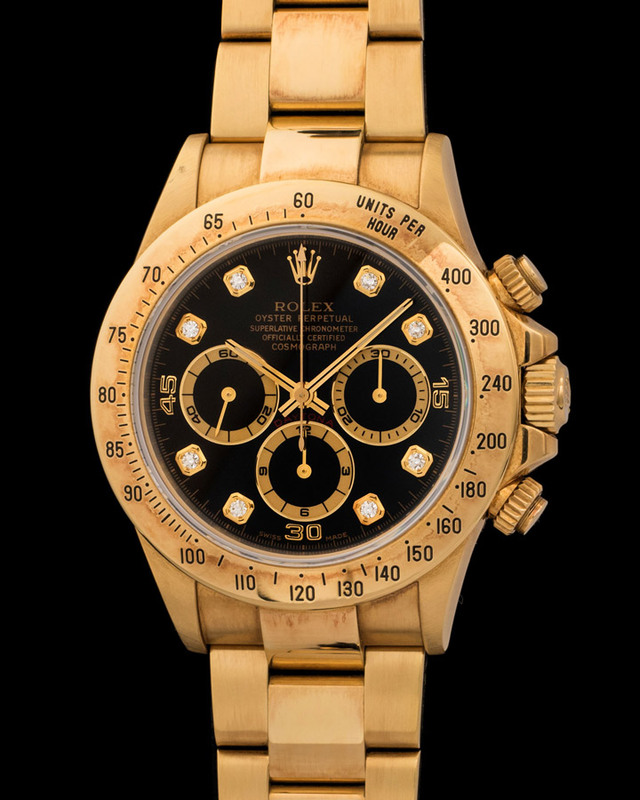 There is a special and inexplicable allure to gold Rolex sport watches and this 16528 really brings it home. 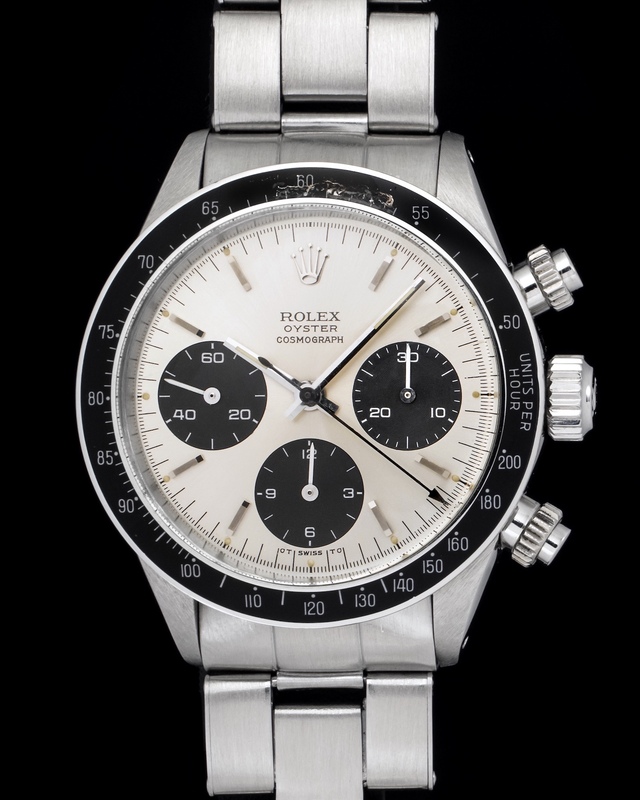 Here we have a very special and rare Rolex Daytona. The dial has 4 lines of text printed on it. Regular Daytona’s have 5 lines of text. This indicates the transition Rolex was going from their Valjoux Daytona’s to their Zenith’s. The overall condition of the watch is unbelievable the 18K yellow gold case and bracelet are as crisp as ever making the watch a collectors item. 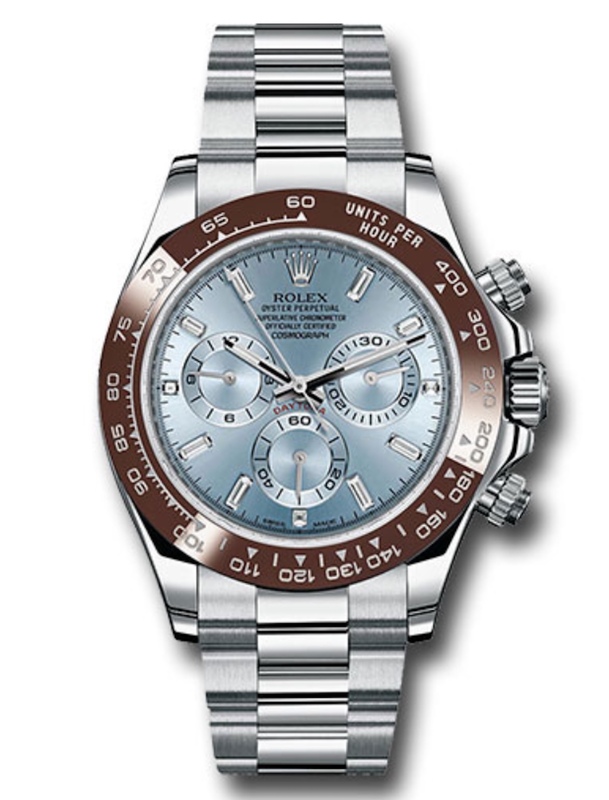 The Rolex Daytona is the world’s most notorious and beautiful chronograph. The 6265 was the last series manufactured by Rolex before moving onto the Zenith movements. These 6265 are becoming very collectible watches as they follow the coveted 6263’s and represent the end of the Valjoux era. 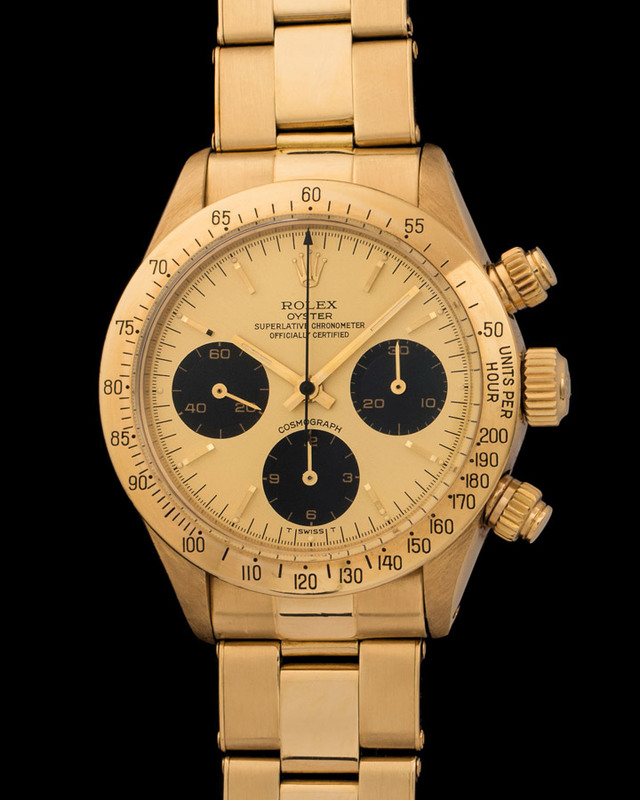 Cased in a flawless 18K yellow gold case this Daytona was manufactured in 1985 and still retains all its original Rolex signed components. 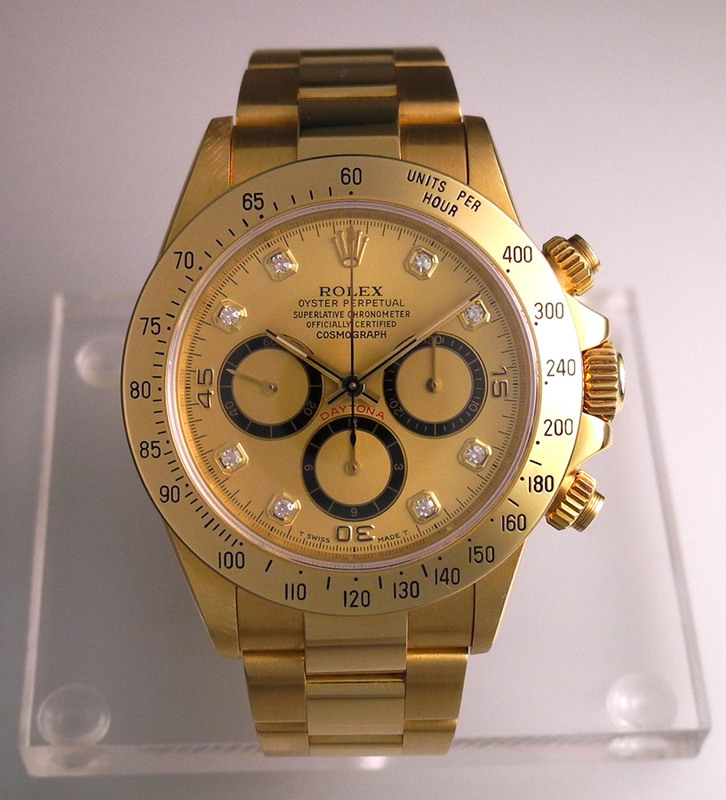 Most people find 18K yellow gold Daytona’s but not many find the elusive 14K ones. The reason is because Rolex reserved those for the American market while the others in 18K were destined for the rest of the world. 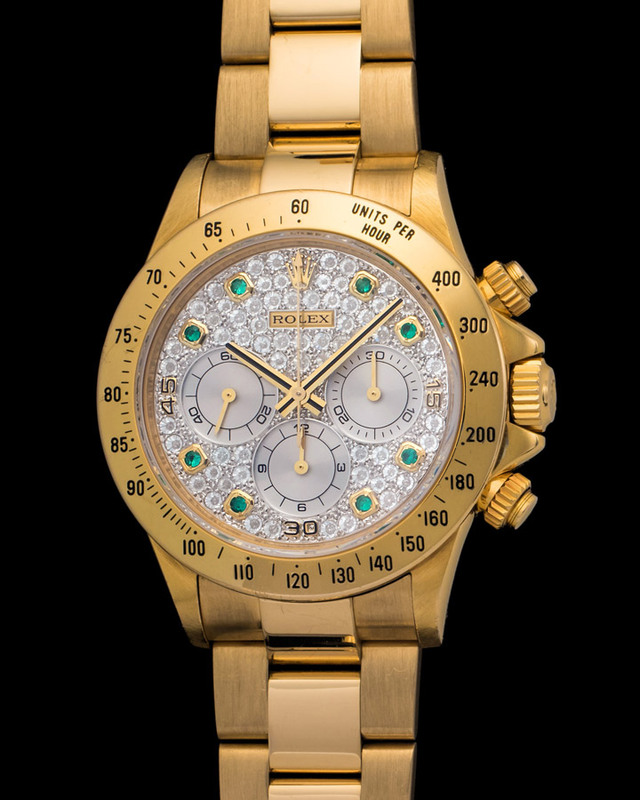 The Daytona 6263 is also fitted with a jubilee bracelet made in the USA, which adds to the overall rarity of the watch. The present watch is distinguished by the “Sigma dial”, meaning that it has the Greek sigma letters on either side of the “T SWISS T” signature below the six o’clock register. The sigma letters on the dial indicate that the hour markers are made of gold. 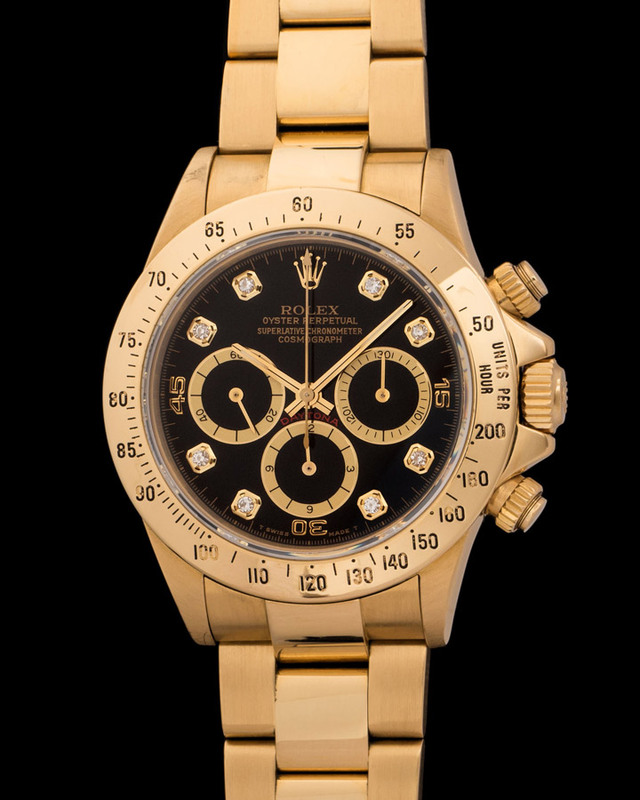 This Daytona comes from the widow of the original owner, who loved Rolex watches and viewed this watch as a prize to be worn proudly and sparingly. The watch is remarkable for the beautiful condition and the fact that the bracelet, pushers, and case are developing a beautiful pink color. 14k gold generally has more copper in it, which can cause it to age pink over time. To find a reference 6263 in 14k with a sigma dial and in this condition is extraordinarily difficult. Vintage Rolex Daytona's can be found in any assortment of conditions and the beauty is that no two examples are the same. Each has its own trait and personality that makes it unique, its what we love about vintage. 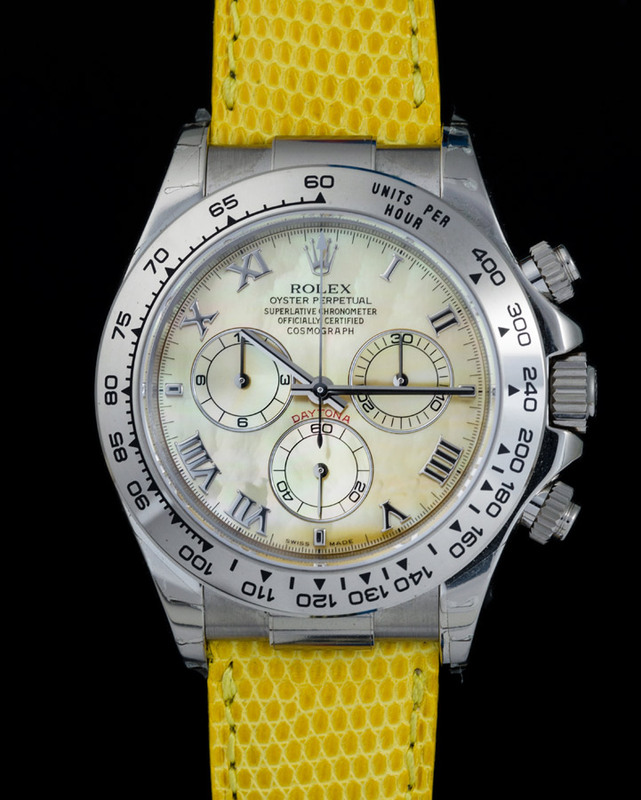 In the case of this Daytona we are offering a 6265 with tropical colored sub dials. Tropical dials have changed colors over time going from black to brown due to unwanted chemical reactions in the dial's paint. The Daytona 6265 is a great reference as it is one of the most durable due to its metal bezel and screw down pushers. This watch wears beautifully and can be considered a daily staple. Launched in 1969, references 6263 and 6265 replaced the first Oyster Cosmograph model 6240. The current example is considered a second generation 6265, as its serial number falls within the range of 3 million and roughly 4.3 million. This 6265 comes correctly equipped with the newer-style steel screw down pushers, often referred to by collectors as Mark II’s. With ridges that are more triangular and wider than their predecessors. As we can assume these watches were used and worn often by their recipients in military environments. The present example is preserved in overall excellent condition, making it a worthy example for the discerning Daytona collector.